A little over two months ago, I received an invitation to join a weight management class that was forming at a social club that I belong to. I’ve always been more or less physically active, but somehow my weight had grown over time. Riding my bike to work over the past four years when the weather is nice has helped; working at a desk job during the day and as an adjunct instructor at night worked against me in terms of managing my weight. I had participated in Weight Watchers and other weight management programs in the past with some success while I was in them, but I quickly reverted to my habitual eating and exercise patterns when I was not. I’m more motivated than I was before; I am getting older and more aware of my own mortality. People my age and a bit older are getting hip and knee replacements; my mother passed away from complications of type 2 diabetes about three years ago; and the occasional acquaintance is falling dead of a heart attack every so often. I live in a hilly area and sometimes struggle to ride my bike up the steeper hills near my home. In short, I knew it was time to do something about my health, and when the opportunity came, I seized it. I’ve had annual physicals for the past 25 years. As a part of the process, I’ve had fasting lipid panel tests that until now, indicated elevated levels of triglycerides and the “bad” cholesterol. My primary care physician has recommended a more healthy diet, but failing that, placed me on a statin regimen. My blood pressure became slightly elevated over time, some of which I attributed to job stress, so I began to take lisinopril, too. 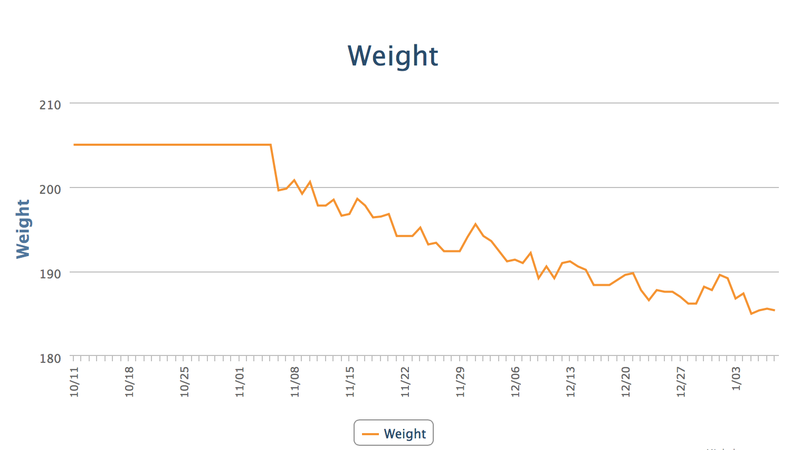 You can see from the chart that I’ve lost about 15 pounds by changing my diet and exercise as part of this weight management program. I’ve also changed my lipid profile to where I no longer need the statins, and my blood pressure has dropped to the point where it is no longer beneficial for me to take the lisinopril, either. My resting heart rate has dropped into the mid-40’s, and I feel much better than I did two months ago. I can’t say that it has been the easiest thing to do. I am blessed that my dear wife supports me 110% in my efforts to eat healthy, exercise, and get enough sleep on a daily basis. I’ve added daily exercise in two key ways. One, I’ve “lengthened” my daily commute to and from work by adding a two mile walk on each end. Two, I’ve taken frequent advantage of my memberships in two fitness clubs, one where I work on weekdays during my lunch hour, and the other on weekends at the start of each Saturday and Sunday morning. When the weather breaks, I will resume riding my bike at least part way to work and back as weather permits. There are many theories around the topic of weight management, some of which are proven, some of which are dangerous, and some of which are just crazy. My own theory is that if you take your weight in pounds, multiply that number by ten, and consume that many food calories each day, you will maintain that weight as sort of an equilibrium. So, if you eat two sausage McMuffins for breakfast, a bacon quarter pounder with cheese, large fires and a Coke for lunch, and an Uncle Sam’s cheesesteak and fries for dinner, and do this every day, you will have no problem maintaining your weight at 350 pounds, especially if you snack on mixed nuts, Doritos and sour cream dip into the evening and top it off with a couple glasses of wine or a beer or two. It’s really not all that hard to do, unless you are a vegan. Even if you skip the alcohol, Starbucks has some great Frappuccino drinks that can give you the calories you need. I’m shooting for 160 pounds right now, so I’ve set my personal goal at 1600 calories per day (net). I plan to keep exercising even after I reach that goal, because I feel better and the aforementioned medical benefits I get from it. One of the many challenges I’ve faced has been giving up the “deal” you get when you order larger portions of food in restaurants. For example, I always used to get the foot-long Subway sandwich because it was twice as long as the six-inch sandwich for only a 20-30% increase in price. What I have found is that by ordering the smaller size portion, I get to keep more money in my pocket and have lost weight in the process that I hope to never gain back. Another challenge has been the prevalence of candy and cookies in the office. As a society, we have Halloween candy, Thanksgiving treats, Christmas cookies, and New Years celebrations that continue into Easter. “Free Lunches” at work tend to be pizza and pop buffets. Calorie dense foods are everywhere. It takes a lot of willpower to avoid grazing on them. This is where the daily measurements and weekly support group discussions add a lot of value to the weight management program. For motivation, I remind myself that nothing tastes as good as losing weight feels, and what I do today affects all of my tomorrows.